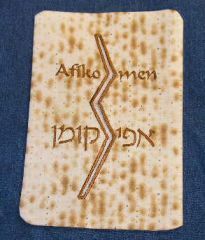 Great gift for your hostess, family and friends. 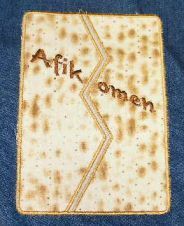 The 5x7 version requires some sewing for the smooth edge but if you have a small Afikomen, the set includes a 6x10 version done completely in the hoop - better break the Matzah before putting a piece in this size! The 6x10 version is done completely in the hoop. Full instructions with many photos included. 5x7 version done Mostly-in-the Hoop! 6x10 version - Completely in the Hoop!